18 British Muslim women from all walks of life have returned to the UK on December 27th after taking part in one of the toughest challenges of their lives. 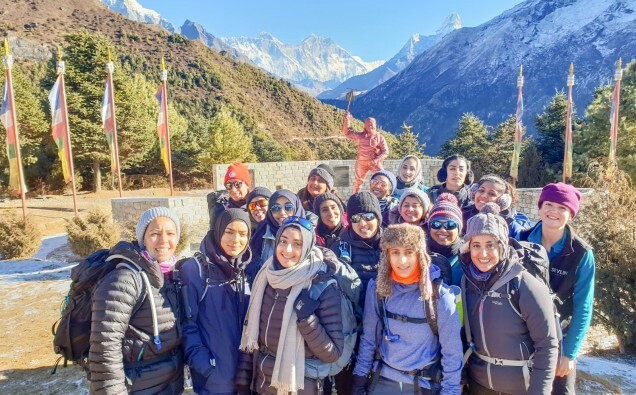 The group are currently climbing towards Mount Everest’s basecamp in an attempt to raise over £250,000 for international humanitarian charity, Penny Appeal. The full team consists of 34 brave volunteers, who are taking part in the 12 day trek, climbing 18,000ft to raise money to help the Rohingya refugees who continue with their struggle for survival within the cramped Bangladeshi refugee camps. Following months of preparation, hikes, gym workouts, and studying, efforts have now turning towards fundraising. Over £230,000 has already been reached, and the team remain hopeful that they will raise even more in their commitment to helping the Rohingya refugees.